There is not a one to one correlation between the labor force and economy and financial markets. However, food stamp recipients, part time workers and labor force dropouts are minimal consumers. There will come a day of reckoning and recent Walmart quarterly results may be a harbinger of that. From Zero Hedge March 3, 2014. 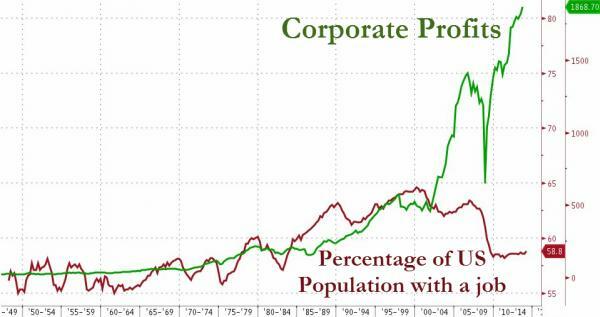 “Record corporate profits – the reason for all-time highs in U.S. equities – come with little hiring or wage gains. The hottest growth stories are business models with lots of customers but very few employees. The recently purchased WhatsApp – for $19 billion – has 55 employees. Investment payoffs – and increasingly social outcomes as well – are technology-enabled, asymmetric and sporadic. How soon before we reach a tipping point? This entry was posted in Barack Obama, Citizen News, Citizens for the truth about Obama, CitizenWells, Economy, Employment, Jobs, Obama, Obama administration, Obama lies, Obama Nation, Obama records, Obama taxes, ObamaCare, The Case Against Barack Obama, Unemployment and tagged Corporate profits and financial markets soar with dimished labor force, The market is not the economy but food stamp recipients part time workers and labor force dropouts are minimal consumers. Bookmark the permalink. Anyone listening to Kerry talking about the Corrupt government in the Ukraine? Was he talking about the USA as an example????? Well, he’s at it again – Zero with his pen and/or phone. Politics trumps everything. Watch Holder’s Justice Dept. get involved in this case. Obama is trying to make the millennial generation into slackers, staying on mommy’s insurance coverage until age 26, etc. What a ridiculous lawsuit, this girl suing her parents because she no longer lives at their house and wants them to pay for her college. Ridiculous, but very much consistent with the Obama era of inflated entitlements. NATO is standing by to enter the Ukraine. Lines are being drawn and sides taken. Obama is showing his weakness. Lurch Kerry has threatened Russia with being expelled from the G8 (as if they give a rat’s crap about the G*). That should make the bear snort and shrug, especially since they have all the Aces.. Do you think Russia give a crap about those ineffective clubs and cliques, like the UN; NATO, EU? John Kerry, the US Secretary of State, has condemned Russia for what he called an “incredible act of aggression” and threatened “very serious repercussions”, (ha ha ha) including Russia’s possible expulsion from the G8. “You don’t just, in the 21st century, behave in 19th century fashion by invading another country on a completely trumped-up pretext,” Kerry said. Really now? Does Libya ring a bell? How about Iraq? Does Egypt come to mind? Then there was Bosnia. Then how about the president and SOS your and substandard actions, or complete lack of action thereof in Benghazi? In her own words, “WE CAME. WE SAW, HE DIED”, reverberates in ominous echoes these days. Those currently in power would do well not to mimic the arrogant hubris of all the dead Caesars, else the Ides of March are upon them. “If you live in a glass house, you shouldn’t throw rocks”. They’ll probably spin it that she’s afraid of the Tea Party or the likes when we all know what the Zero regime does to those who are no longer useful to them or those who get in their way. This is a good read, and explains how the usurper lied his way to the white house. I don’t have a Harvard law degree like Barack Obama purportedly does, in fact I didn’t even graduate high school, but you don’t have to have a degree to know when someone’s lying to you and you don’t have to be an expert to understand the crime of forgery, fraud and treason. We know now that Barack Obama has a forged birth certificate, forged selective service registration and stolen social security number. Obama conspired with one or more persons to defraud the American people and to usurp the White House. It is no longer a conspiracy theory. The crime has taken place.1 Barack Obama used Fake ID to get on the ballot and into the White House. So we can all take off our tin foil hats and look at the bonafide evidence.2 Just like any jury, I am asking you to consider this evidence, with a fresh set of eyes, before coming to a conclusion. A key part of that evidence is Obama himself. Have you ever heard the saying, “Lie on 1”?3 Lawyers use it when a witness or suspect lies during a legal proceeding. It means that nothing they say after that initial lie is going to be believed. Barack Obama is a “Lie on 1” a hundred times over. He is a pathological, compulsive liar. 4-5 read more……. companies are fully staffed and taxed under obam, if forced to take on more workers then they will have to cut benefits and pay. The key to solving this is first to look at the stats and see if they are real or not. I suspect they are fake data. The second is to look at why company’s are not hiring, it’s clear that the policies of the government are not creating high paying jobs and choking the middle class to death .